The C.M.B. Investment brand presents a corporate group, which is formed by more than one hundred companies from various segments and industry sectors. The group is managed by managing company C.M.B. Investment Ltd. The business philosophy of the group is focused on the acquisition of companies that have financial or operational problems, and subsequent settlement of creditors in the form of restructuring and valuation of assets using effective crisis management. We have been operating on the Czech market for over 20 years, and since 2014 under the new C.M.B. Investment group brand. The appreciation of investments of our group and long-term growth value of its assets is based on three basic activities - pillars. More information about the activities of the group can be found on our pages under individual sections. C.M.B. Investment is a group that consists of more than one hundred companies that are under the direct control of the parent company of the group - CMB Investment Ltd. Total volume of assets managed by the group exceeds 2 billion CZK. The parent company covers the activities of the group across different sectors and as the management company, it is responsible for the strategy of the group and its long-term advancement. C.M.B. Investment Ltd. is registered in the UK. The owner of the group is Vít Zaorálek. We have been operating on the Czech market for over 20 years, and since 2014 under the brand of the group. The years of experience and know-how acquired from the business allow the group to undertake even riskier business scenarios. Within our business, we cooperate with renowned Czech and foreign legal and audit firms. We buy companies that are in a problematic financial condition and restructure their obligations. Our long experience in this field allows us to engage riskier issues and cases. We are very good at evaluating and managing risks using sophisticated methods, as well as predicting and successfully implementing subsequent returns. And all this in collaboration with renowned Czech and foreign legal and audit firms. We actively and effectively manage a portfolio of group companies in order to increase the long-term value of their assets. We trade with receivables and effectively manage and diversify them. C.M.B. Investment Ltd. - The parent company covers the activities of the group across different sectors and as the management company, it is responsible for the strategy of the group and its long-term development. The business activities of the group consist of acquisitions of companies that have financial or operational difficulties. Our long experience in this field allow us to engage riskier issues and cases. Acquisitions of companies are financed mainly from operating capital, in certain cases also through a combination of outside capital. These activities within the group are carried out by a team of professionals and experts with years of experience and practice in the field based on project management. 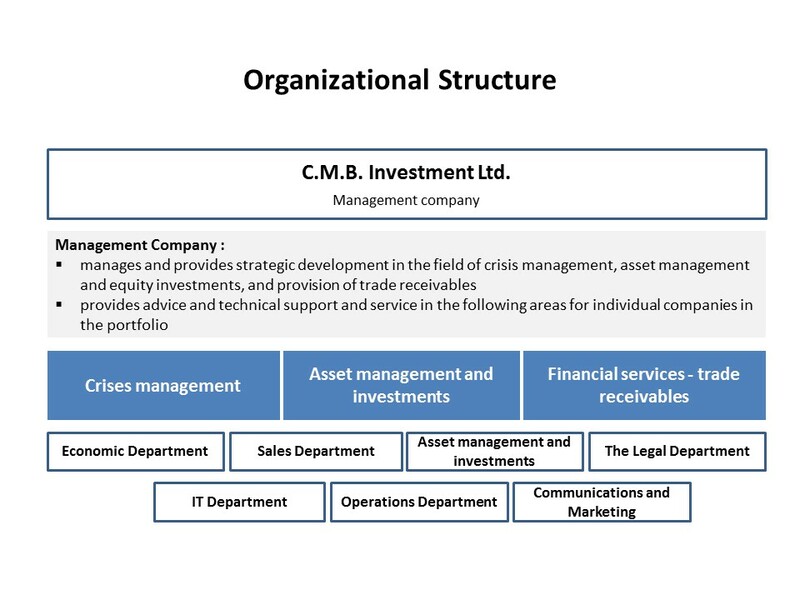 The organizational structure of the group allows for quick evaluation of investment opportunities, implementing acquisition processes, active crisis management and efficient management of assets and equity. Copyright © 2019 C.M.B. Investment Ltd.